Elegant and timeless custom built home situated on a private, maturely landscaped and treed 85’ x 236’ lot. Desirably located south of Lakeshore Road, only steps to Lake Ontario, walking trails and the quaint downtown shopping district. This classic 7,400 sq ft, five bedroom home was designed by renowned, award-winning Toronto architect Joan Burt and built by Snyder Construction in 1997. The mandate in design and construction was attention to detail, coupled with the pursuit of quality throughout. The result combines the convenience of state-of-the-art amenities for modern family living, while capturing the craftsmanship and character of a historical home. This home features over 4,700 sq ft above grade, plus a fully finished 2,700 sq ft lower level. The main and upper levels feature reclaimed 120 year old, 1.5” thick Hemlock wide plank flooring. All three levels are finished with extensive millwork in historic profile, including wainscoting, custom casings and baseboards, plaster moldings, solid doors and lots of cabinetry built-ins. Much of the millwork is painted in a historical colour palette, providing warmth and adding to the overall appeal of the home. The interior also boasts handcrafted reproduction lighting fixtures and solid brass hardware throughout. This home has an aura of relaxation, the kind of home where you want to curl up with a good book next to one of the many wood-burning fireplaces. One of these fireplaces brings warmth to the kitchen. Situated next to the eating area and adjacent to the sunroom, this paneled wood-burning brick hearth provides a tasteful separation between the kitchen and the family room. The kitchen itself is large and flooded with natural light from the numerous windows interlaced into the cabinetry. The kitchen features top of the line appliances, including a 36” Thermador gas cooktop/BBQ, Dacor 30” double convection wall ovens, a 48” side-by-side SubZero refrigerator and Miele dishwasher. Abundant cabinets are face framed, shaker style, hand rubbed cherry wood and feature a built-in china cabinet, roll-out drawers, apothecary drawers, slide-out corner drawers and more. Granite countertops, French hand painted tile backsplash and a beamed ceiling complete the overall look. A slate floored sunroom off the kitchen, with radiant heating and floor to ceiling windows overlooking the garden provides easy access to the covered back porch and stone patio. 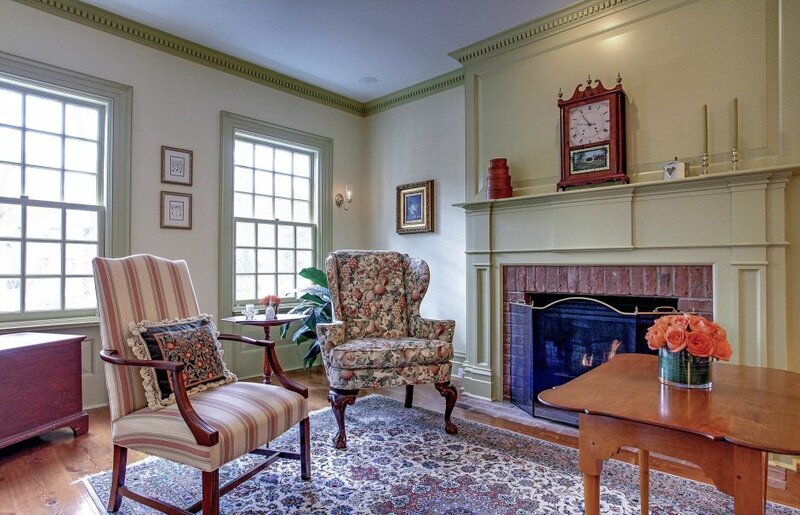 The generous sized family room also features a wood-burning fireplace and is surrounded by floor to ceiling built-ins. As spectacular as that wall looks, the grand Clerestory skylight is the room’s most outstanding feature. Over 12 ft ceiling heights and a beamed ceiling in this room add to its allure. The main floor also features a private office, a gracious living room and an elegant dining room with adjacent butler’s and storage pantries. There is also a very spacious mudroom with slate radiant floor heating that accesses the main floor laundry and double car garage. Lots of functional closets for the family are located here as well. Solid mahogany staircase handrails guide you to the second floor, while light spills down the main staircase through a custom framed circular skylight from above. An exceptionally well-appointed Master Suite awaits you on the second floor. The sitting room and private balcony take advantage of beautiful backyard views through floor to ceiling windows. A tranquil and private retreat, the luxurious master bath is elegantly appointed with custom vanities and marble tile, radiant floor heating and Hunter Douglas Silhouette blinds throughout. Set apart from the Master Suite, the children’s quarters, comfortable and spacious, host three bedrooms, two bathrooms and a private area with plenty of natural light and space for children to play or study. The home’s lower level, with over 8’ ceilings, was designed to have a main floor feeling. Full sized windows allow for an abundance of natural light to pour into the living area. 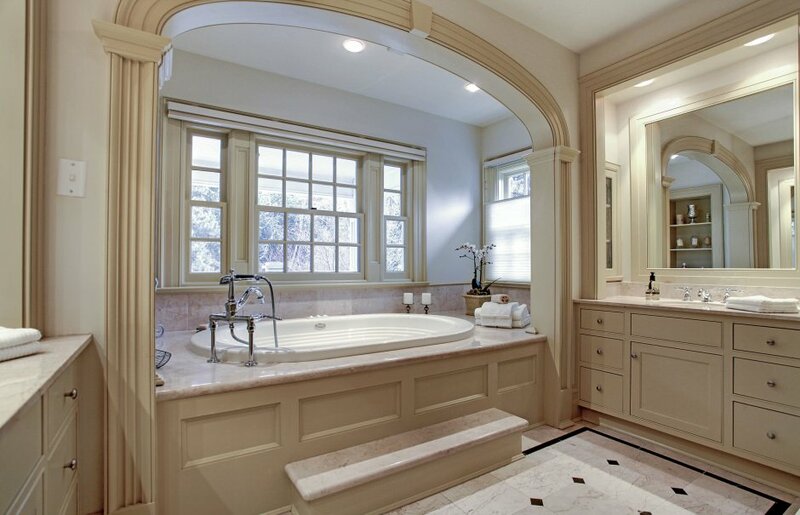 The fifth bedroom and large bath are also located on the lower level. Combine this with direct access to the backyard and you have the perfect guest or nanny’s suite. The lower level also features an exercise room, a large workshop and three separate storage areas. Outdoors, a built-in wood-burning fireplace complete with cooking centre featuring a Weber natural gas BBQ, provides a perfect space for outdoor entertaining. Enjoy the privacy of the well-treed backyard, set on a professionally landscaped lot, with the picturesque home providing a stylish backdrop for any outdoor fête. Oak, walnut, pine, blue spruce, hemlock and magnolia trees embellish the well cared for gardens. The three wood burning fireplaces on the property provide a timeless charm, warmth and tranquility. Modern amenities include 4 gas fireplaces, built-in Bose ceiling mounted speakers both inside and outside of the home, a built-in intercom system, keyless entry access and monitored security system. Meticulously maintained and such a desirable location makes this rare gem in South East Oakville, one-of-a-kind, and sure to please.